Write offers subject to interior inspection. Great Opportunity! 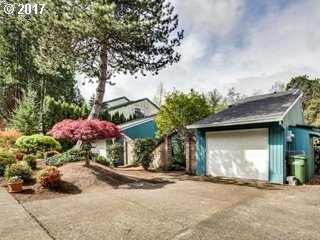 Duplex in Lake Oswego neighborhood on private cul-de-sac, large decks facing natural woods. Conveniently located between New Seasons, Bridgeport and I-5. LO schools and parks. 1394 sq ft in each unit with high ceilings and large master bedroom and bath up in loft and 2 bedrooms/1 bath downstairs.Lease ends,unit 1- 06/30/2018. Unit 2-02/28/2018. $1345 month leases each unit.